The latest beer to graduate from the twisted collective consciousness at Melbourne's Moon Dog to a single keg brew to be tapped on a Thursday and then finally get the nod of approval as a nationwide packaged release is one of their most surprising. 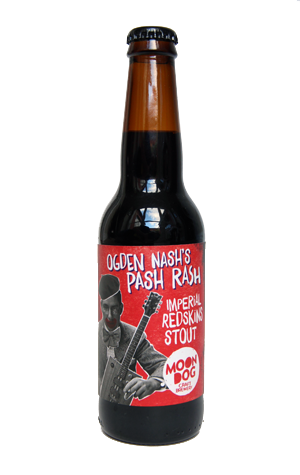 Just like the black IPAs that take the concept to its extreme – creating a black beer that smells and tastes utterly like a pale IPA without even a hint of chocolate or roast – Ogden Nash packs quite the one-two punch. One: it possesses the overwhelming raspberry lolly aroma of Redskins. Two: it tastes much as you'd expect from a dark brown / black, tan-headed beer. The fact that it's pitched as an "Imperial Redskin Stout" and has a label informing drinkers that 5,800 of said lollies were unwrapped (over several painstaking evenings, we understand) should be enough warning, but we guarantee you'll still be blown away by just how lollified the aroma is. Equally, having been blown away by the explosion of raspberries, you'll be just as surprised to discover how relatively little of that raspberry character translates to the mouth. Or indeed the sweetness you might expect from 5,800 lollies, with the sugary Redskins fermenting out to leave a tight (for its size) imperial stout that's more about dark chocolate, roasted barley and drying cocoa than anything from your childhood (unless you had weird tastes as a kid, or even weirder parents).